Over the last two days, we haven’t had the weather we were hoping for. We need clear skies so that the pilots, Troy and Derek, can find suitable landing sites on the frozen Arctic Ocean. I’m glad they have a vested interest in this, as they don’t want to end up on ice not thick enough to support the plane’s weight. Yesterday, although it was a beautiful sunny, clear day here, it was bad weather where we wanted to fly to. So we spent an afternoon on the fast ice a few kilometres from the base. Fast ice is a frozen bit of the ocean that is attached to the shore and doesn’t move. You can reach it by skidoo, which is what we did. 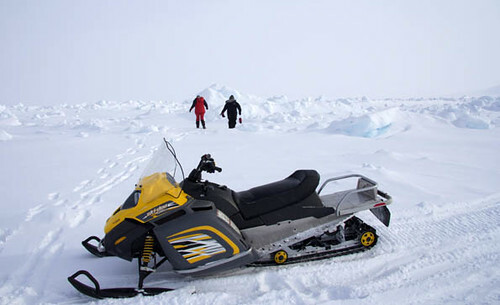 After winding our way through the blocks of ice, and stopping a few times to roll the skidoos back over when they hit the ice a bad angle, we found a suitable site to deploy the corner reflectors. It was a pleasure to be out there yesterday. Unfortunately, I forgot the battery for my camera, so the photos here are from Seymour. 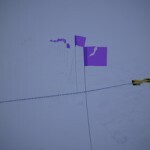 As Rosie mentions in the previous post, we even saw polar bear tracks on our way back, which is a bit scary – but we make sure that we keep watch while we are working. –23°C, with the wind chill it was –37°C. However, we did go out near the base to practice laying out the survey grid that is positioned around the corner reflectors and to see how long it took us to make some snow depth measurements. This is all useful experience, as when we do get out onto the Arctic Ocean itself we will have limited time on the ice before we have to get back into the plane, so only one chance to get it right.